It all started with Ralph eating raw celery with mayonnaise, his favorite way to eat celery. No matter how good celery is, I'll never eat them. I just can't stand the taste of celery! I know it's a great vegetable but I can't understand how anyone can like the taste of it. I don't eat a great variety of greens every day, and tend to avoid some of the best greens. Oh, and I don't eat green pepper at all too! Ralph tried to get me to drink green juices, which was a challenge, and so he had to get creative... to make sure I'm getting plenty of greens as juicing helps me consume more vegetables than I could eat on most days. Green Ingredients: celery stalks, cucumber, bitter gourds, green apples and great hog plums. 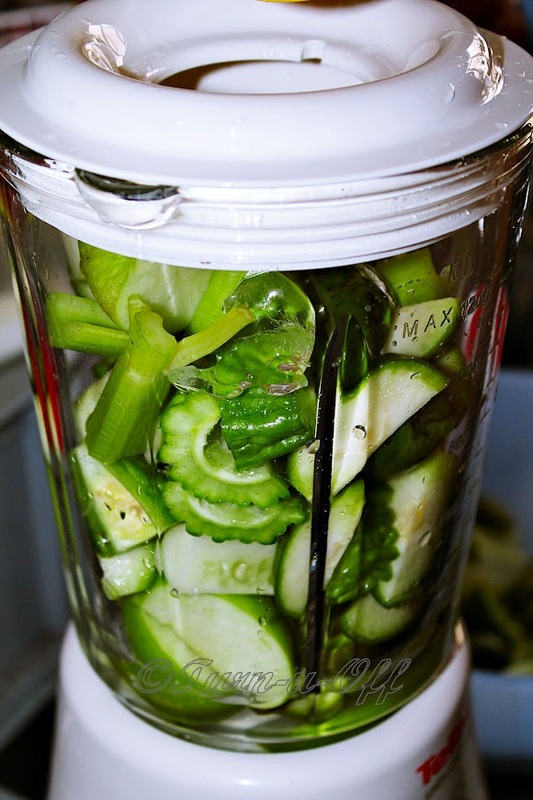 He used great hog plum as a substitute for green pepper. 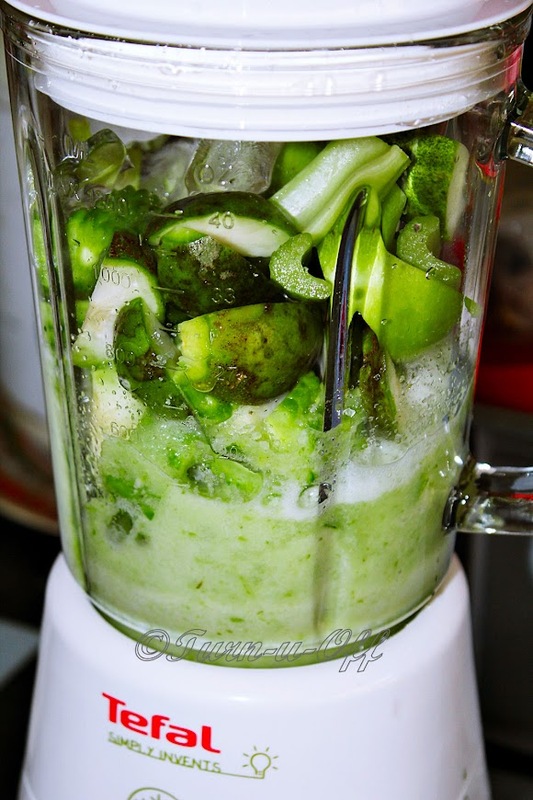 Add the chopped fruits and vegetables to the blender (we don't have a juicer), along with a small amount of water. Then, he strained the juice through a fine strainer and used a large spoon to mash the pulp and push the juice through the strainer's meshing. So, I sipped slowly trying to figure out what it tasted like. The green juice was unbearable the first sip I had it! Green apples and cucumber neutralized the bitterness of bitter gourds but all I could taste was celery!? Maybe he just needs to use a little bit of celery and then drown it in other fruits and vegetables. I forced it down but even though I knew it was great for me, I just couldn't force myself to drink this 5-green juice anymore. haha so will you dare try it again Mon? Hahahaha wow!! That's definitely as GREEN as it gets! I've had all of them separately as juices before.. but never together. I wonder how that would taste like. Except for the hog plums? How do they taste like? Don't think I've ever had them before. But I have drank bitter gourd juice religiously before.. remember that "mysterious disease" I had? I did all I could to get rid of it.. so I also blend (we don't have a juicer) but I was told to drink it "unstrained". Yucky lah the pulp.. so bitter.. the taste itself is okay.. the aftertaste is the worst.. like whatever you eat/drink afterwards doesn't get rid of that taste. 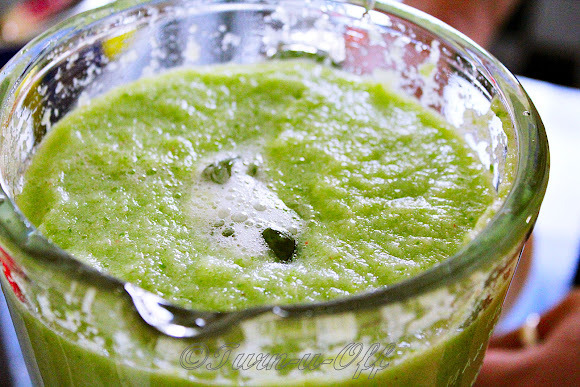 i was thinking apple and celery with bitter gourd would probably blend a good taste..
but with what you said te mon, maybe i shouldn't try this one anymore.. LOL! You take care and have a great week ahead! Hugs!